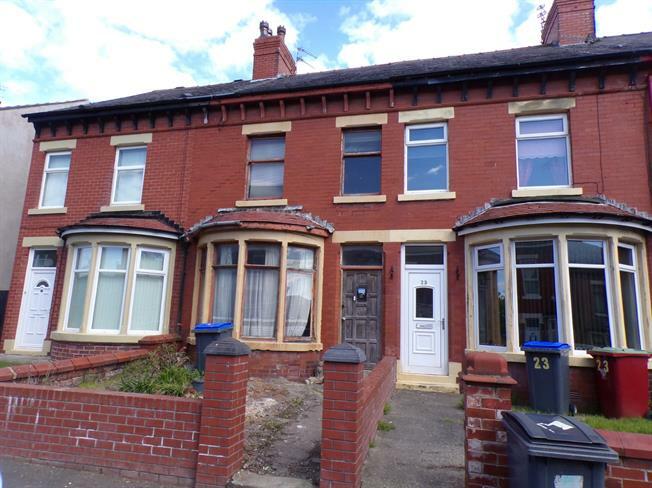 2 Bedroom Terraced House For Sale in Blackpool for Asking Price £60,000. This spacious two/three bedroom house would make and ideal investment/project opportunity with full renovation works required throughout. The accommodation to the ground floor consists of entrance hallway, two reception rooms, kitchen and separate utility room. To the first floor there are two double bedrooms with the front bedroom being easily converted back to two bedrooms to make this a three bedroom house and there is also large family bathroom. There are gardens to the front and rear, viewing of this property is essential to fully appreciate its size and potential it has to offer. Single glazed wood bay window facing the front. Radiator and gas fire. Single glazed wood window facing the rear. Gas fire, under stair storage. Single glazed wood window facing the side. Fitted and wall and base units. Single sink, space for washing machine. Double aspect single glazed wood windows facing the front. Radiator. Externally there is a concrete garden to the front and a concrete yard to the rear.